This cheese was first made in 1830 on small farms in Wales, close to the town, and the famous castle, called Caerphilly. Today, it's mainly produced across the River Severn in Somerset, which is English turf. 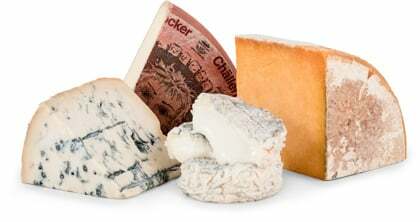 Like most cheeses, it was originally created to use up surplus milk and was only sold locally. Welsh mine workers would wrap the cheese in cabbage leaves to take as a handy self-contained lunch "down the pit"—so Caerphilly quickly became a miner's staple. 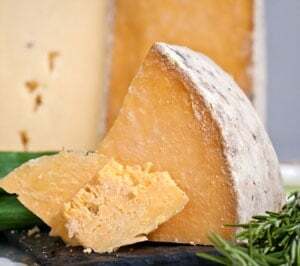 Before the birth of Caerphilly, Somerset Cheddar had been the popular choice. It was thought that cheese absorbed the toxic substances which the miners inhaled. Caerphilly cheese replaced more of the salt the miners lost while working and it had a fresher flavor and softer texture. Caerphilly began to provide a source of income when marketed at the fairs during the early nineteenth century. Demand quickly exceeded supply so a cheese market was established including cheesemakers from the Vale of Glamorgan to Chepstow. At the height of production, two and a half tons of Caerphilly was sold weekly. It was common to see the flat round cheeses, each weighing from five to ten pounds, being unloaded from horse drawn carts and wagons, and stacked in an open building on the town square. We’re confident you’re going to enjoy this delicious cheese from Abbey Farm. This young cheese has an ivory white rind with a pale colored paste and semi-firm texture. It's a moist, crumbly cheese, and its flavor is usually described as salty buttermilk, slightly sour, but buttery. The nose is slightly sour but not overpowering. With its tangy taste and distinct smell, this gentle cheese is one you could probably pick out blindfolded. Left to mature in moist cellars, the whitish moulds become thicker and more leathery. The cheese will be more rounded and creamier, and of course, the taste changes. Caerphilly's flavor is brought out when served alone or paired with dry white wines, bread, and/or fruit.